There is a big surf contest this weekend on our beach. The charity sponsor for this event is the Mauli Ola Foundation. Tricia and I first heard about Mauli Ola from our dear friend Emily Haager...you might remember me posting a few photos of us with Emily from a several years back whenever her family would vacation here from California. 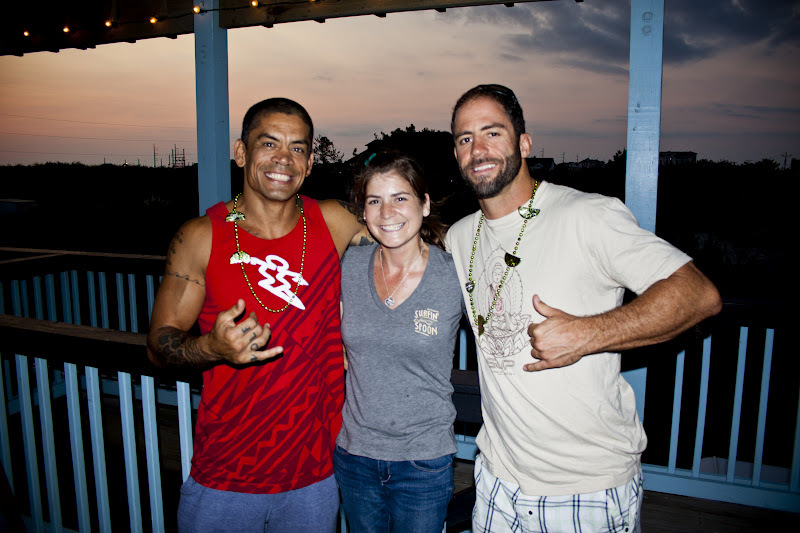 We again heard about Mauli Ola today from another CF family (the Whiddons) who have become friends of ours recently...they told us that some of the surfers and MMA athletes who work with this organization were in town for the event this weekend. We found out that they were going to be at one of our favorite local restaurants tonight, so we took the kids and met our friends for dinner. The Whiddons introduced us to Kala Alexander and Nissen Osterneck. They were both super nice...Kala remembered all of our names, and they both signed autographs for the kids and talked with Tricia a while about her CF. We're hoping to hang out with them tomorrow during the contest, maybe even do a little surfing with them if the waves are up. Make sure you check out this video and see what Mauli Ola is doing for kids with CF! And, see our friend Emily, who passed away a few years ago, around the 1:27 mark. Just a quick not to tell you that Gwyneth's cochlear implant activation was successful! It will take some time for her to get used to this new device on her head, and probably a few months if not more before we begin to see her speech improve because of her new hearing. We'll return a few times over the next several months to have the audiologists adjust the settings until they get it exactly right for her needs. If you want to learn more about the exact implant system Gwyneth has, you can read about the Cochlear Nucleus System here. Gwyneth's new friend, a koala with implants just like hers! Highlight of our trip...Gwyneth bumped into a North Carolina hero in the lobby at Duke...do you know who this is? We are so excited about Gwyneth's activation tomorrow! We have no idea how she will react...she has enough hearing in her left ear that we don't expect it to be too dramatic. We know that kids her age often have a difficult time adjusting, and considering she has had almost no hearing in her right ear for at least a few years, we are anticipating she might not be too happy with it at first.